Anthem is the largest town in the North Phoenix Corridor, straddling I-17. While the west side of town is in Phoenix, the east side (including Country Club) is in Maricopa County. See our Anthem Overview for a comprehensive description of the town, its governance and amenities. Community amenities include two 18-hole championship golf courses. There are two full golf practice areas with all-grass driving ranges, short game areas and putting greens. The clubhouses feature pools, fitness facilities and fine dining. Country Club residents also enjoy full access to the amenities of Anthem Parkside, including a water park, Olympic-size swimming pool, tennis courts, an expansive gym and fitness center with rock-climbing wall, indoor and outdoor basketball courts, several sports fields supporting community-organized soccer, flag-football and baseball leagues. The primary public high school is Boulder Creek High School. There are three public K-8 schools serving the club: Anthem School; Diamond Canyon; Gavilan Peak. Learn more about these schools (and their boundaries) and other options (charter & private) in our overview. See also test scores compared plus enrollment Figures. All shopping areas are outside the Country Club section. A Fry’s Marketplace and a Safeway grocery anchor two of several shopping plazas in Anthem. There is a Walmart, and the Outlets at Anthem is populated by a range of brand-name stores. There are several restaurants and a full array of business services in town. Two other major shopping centers are just 20 minutes south. There are four regional parks for hiking, boating and other outdoor activities, all within a 30-minute drive. 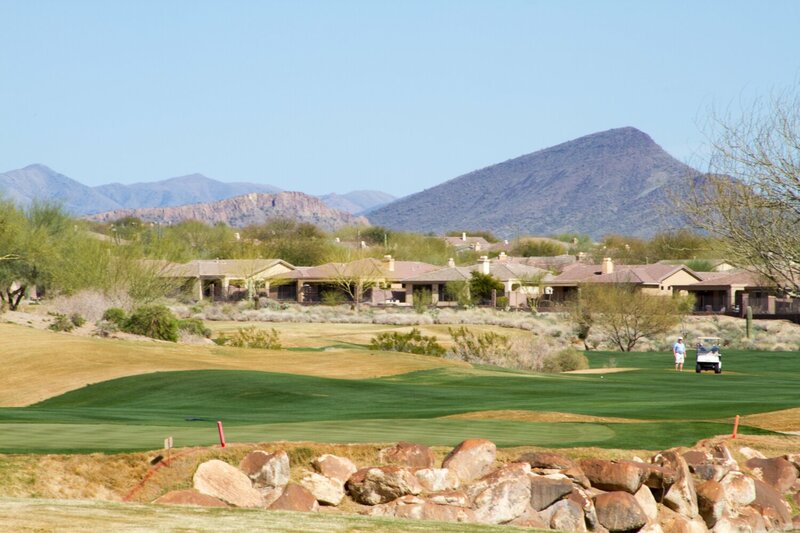 Country Club is about 40 miles from Sky Harbor International Airport, 30 miles from Scottsdale Airport, and 17 miles from Deer Valley Airport (distance/time estimates). See our North Phoenix Map for an overview of services and attractions in the region.